Penny Powell recently shared photos on Facebook, after a good friend of hers found out why her son had been chronically ill. The boys father, Simon, had a suspicion as to why their young son wasn’t getting better, and he turned out to be right. The boys sippy cup had a leakproof spill, and when Simon inspected it, he noticed an awful odor coming from it. This feature, which makes these cups so convenient for parents, is sealed. 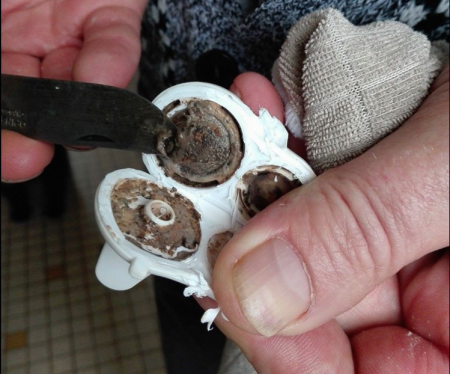 When Simon cracked the spout open with a knife, he found something growing their that explained his baby’s illness… MOLD!! his son had been drinking from a mold infested cup! Needless to say he was outraged, disgusted and frightened for his son’s well-being. He took pictures and when Penny posted them on Facebook, other parents began sharing the same thing. They had all been using Tommy Tippee Cups. 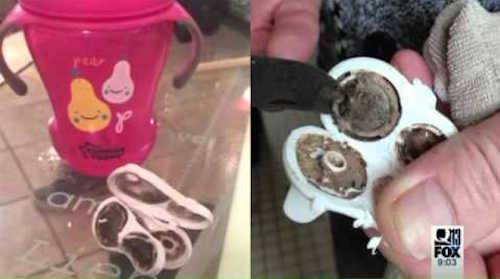 The company’s response to this finding is quite lame, as you will hear in the video; it should be said that there are several other manufacturers that have a same design in which the sealed spout is a breeding ground for mold. As mold can cause sinus infections, throat irritation, asthmatic symptoms, and chronic eye and skin irritation, it is strongly recommended that any such cups be discarded. Please SHARE this important health information with your friends and family on Facebook, to help prevent other children from being exposed to this hazard!